Investing time and energy to ensure that your email marketing is looking great, your branding is consistent and aligned with the CI and your content is relevant and exciting will ensure that all your electronic communication objectives are met. However, Alison Treadaway, Director Striata warns that companies are often unaware that a large portion of their email communication is neglected, poorly structured, almost never updated and usually not tracked. “Transactional email, a vital component of Customer Lifecycle Communication, is often the poor, forgotten cousin in the email marketing family.” Treadaway says. Transactional emails typically suffer from poor layout, no design and are plain text. They do not adhere to the corporate identity or promote the brand values. Companies should move beyond the basic process of transactional mail (action + confirmation) to derive more value from this channel. A transactional email is the automatically generated response to an action. When someone interacts with an organisation; there’s a follow up communication sent by email. Examples are: a confirmation or failure notification, a receipt, an invoice, a booking form etc. Treat transactional emails as a vital part of the brand experience – make sure they adhere to the brand identity and digital communication guidelines. Some notifications can be time critical, so keep the message size small and minimise the risk of the message being filtered by adhering to email marketing best practice. This doesn’t mean the transactional message must be devoid of layout, design or value add. Don’t waste the opportunity to use these customer touch points for brand awareness, cross sell, up sell and establishing a dialogue with your customer. Keep it simple but use the opportunity to reinforce your brand, make an offer or get feedback. 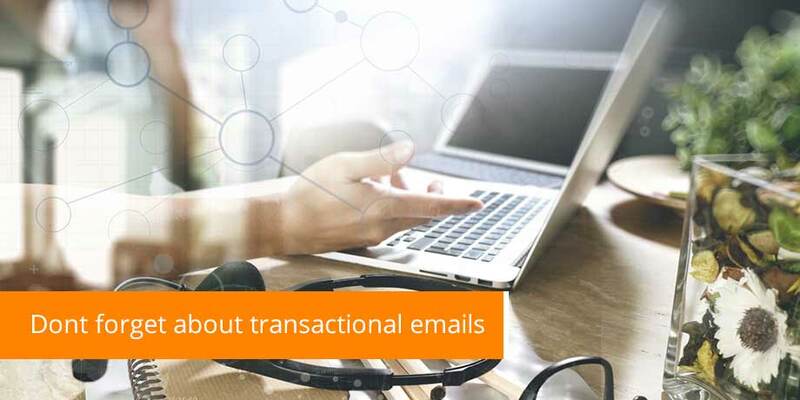 Transactional email provides an ideal opportunity for you to engage with customers where you already have an established electronic relationship. Therefore, take advantage and use this valuable channel to extend your brand and if you don’t have the time or resources to do so, then make a smart move and outsource to an electronic messaging specialist such as Striata. Give your Customer Lifecycle Communications a face lift, your brand deserves it!